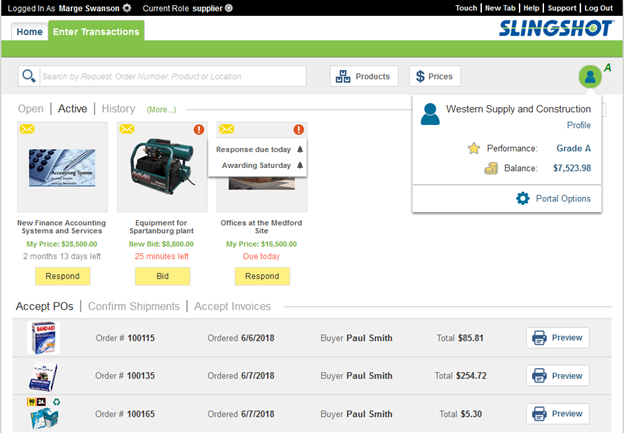 Slingshot’s Supplier Portal allows registered suppliers to collaborate and add value to the customer relationship. The goal is to promote improved efficiencies for both the supplier and its customer. Suppliers can participate in RFx initiatives (RFQ, RFP or RFI), acknowledge and accept purchase orders, confirm shipping schedules, accept priced invoices, review performance statistics, update catalogue data (products offered and current pricing), update profile and supplier qualification data and review invoice history including a payment schedule for open invoices. The supplier portal has been enhanced with a supplier dashboard providing “one click” access to all of the above functions. The supplier will receive Email notifications informing them of an RFx opportunity, the need to confirm a document or the need to update profile or qualification data. A link in the Email takes the supplier to the form below.